Advantages: Great colour and b/w coverage; good selection of Allied and Axis aircraft; very involving; great inspiration for modellers. How many of you have taken your Bf-109 model and got in a tail chase and made the gun sounds? Come on, be a man and admit it. Maybe that is why I like the Bf-109 so much - because I saw so many being shot down over the years. This DVD from Victory Films highlights all the excitement that fighter pilots and bomber crews experienced during WWII, without all the danger. You are able to sit down and analyze the engagement. You can see a Me-262 and a Me-163 in the cross hairs of allied fighters and in color. The video is in both color and black and white. There is film of fighters both allied and axis taking off in a prelude to combat. The time frame is hit or miss in that there are videos of Bf-109Es, and Me-262s in the same sequence. That really isn’t important as the video itself is impressive in its own right. Watch as the 56th FG take off to engage the enemy. There is very limited talking and when it comes it is documentary style. It is actually only one sequence. The rest of the video is engine sounds and gun sounds. It is actually very nice and the way I would rather see something like this. I don’t want to hear a narrator tell me about an engagement I can see. The engine and gun sounds just add to the excitement. The first part of the video concentrates on the ETO. This shows the assault on Fortress Europe by B-17s and B-24s. The engagements are so close that they show just how much courage was required on both sides. You are so much a part of the battle that you see your wingmen attacking and the return fire from the B-17s. In some of the sequences the B-17s fill the screen and once you fly by that one there are four more in front of you. Suicidal or heroic comes to mind. Fire, debris and parachutes are everywhere. Then the allied fighters enter the battle. The German fighters are attacked at close range. Some so close the FW-190 is filling the screen and the P-47 seems to fly formation with it until the FW is shot down. Amazing stuff. P-38s are included as well. What is amazing is the fact that this stuff happened every mission. There are sequences where you are engaging the enemy and another aircraft, friend or foe, flies through the screen. The Me-262 engagement is impressive as is the flat spin that he gets into after being shot down. The Me-163 is shown in its unpowered glide being engaged and shot down by P-47s. See the Komet on the ground being strafed as the pilot runs for cover. Then it is down on the deck, flak, towers, buildings, wires, towers, explosions, and everything else that can take down an aircraft is shown. Find yourself shooting up trains, airfields, power lines and buildings. You’ll find yourself leaning into the turn and telling the guy to lead him some more. It is hard not to be involved in the video. The second video focuses on the MTO. The color footage is so clear that it is amazing that it still exists. It is like being at the airfield when the Thunderbolts take off. This is the best footage I’ve seen of MTO P-47s. You’ve all seen the documentary of the P-47s in Sicily but I guarantee you haven’t seen it as clear as this. You’ll see the P-47s fly over the Berghof and pound the living crap out of anything that moves and some things that don’t. Even horses are not immune to the awesome firepower of the Thunderbolts. You’ll love the weathering on the camouflaged P-47s, excellent reference material. You will also like the nose and fuselage art that are plainly seen. The color and resolution are so clear you will think that these were taken yesterday not yesteryear. This is the stuff Hollywood should watch before they film an airplane film. Interspersed with the gun fire is the occasional rocket launches. There is a very close up belly landing of a P-47 that literally slides to a halt in front of the camera. Very dramatic. The next chapter deals with the ETO but this time it is from being on the continent with the 9th AF. There are some great photos of taxiing P-47s and P-38s with their painted out D-Day markings. Some of the new P-51s are also shown taking off. Engage FW-190D-9s in full color. You can even make out the markings on some of them. You get so close to the action that Mustangs cuts you off from a sure kill. That is excitement. From altitude to grass cutting heights this section has enough smoke and fire to make an arsonist happy. This is what air superiority is all about. The flak is all around and you wonder how they ever got through it. A beautiful color shot of an SBD opens the sequence for the Pacific. Features show P-40s, P-39s, and Iwo based P-51s taking off and shooting everything that moves or flies, including a crippled B-24? Somebody needs some target identification classes. Receiving friendly fire, returning same. It is nice to see how beautiful the Pacific can be when you are not blowing things up in it. These guys are so good that they can shoot power lines and the towers. Really impressive shooting, not an effective use, but impressive shooting. Look closely and you’ll notice the P-51s have three antennas, two on the spine and one under the fuselage. This was something new to me. Bring on the Zeros, Franks, Tojos and Bettys, all in color. A color carrier takeoff opens up the Navy portion of the DVD. The take off shows lots of detail about the carrier deck markings. This will be useful for the modeler. Shooting down Zeros is the call of the day. Man those Zeros just flame at the slightest hit. If you take off from the carrier you have to land and there are some very nice landings that finish off this portion of the DVD. B-25s are the feature of the documentary “The Earthquakers”. I personally have never seen this particular color video. 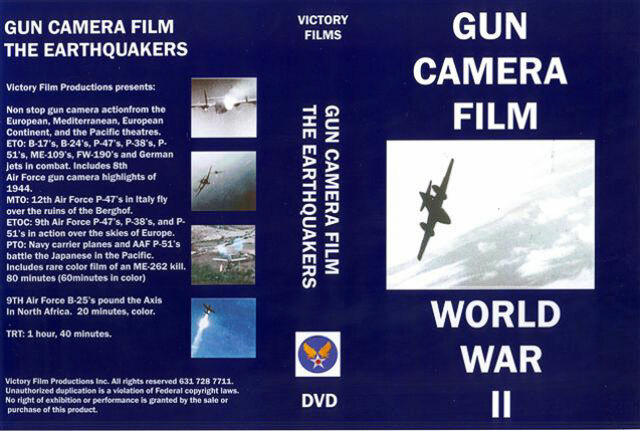 It is typical of the period newsreels, the Earthquakers is narrated but it is in full color. The Mitchells are the highlight of this film. They show the desert pink colors and nose art to advantage. If you need motivation to paint a figure, this video shows people on pedestals just like figure models. Life imitating art? Full color shots of destroyed Me-410s, maybe 210s are shown to effect. You will love the colors of these aircraft, not your usual greys. Some of the narration shows its age by references to the wife doing the dishes while you smoke your pipe while listening to Bing Crosby in your easy chair. Those were the days. It is interesting to see how they recover a belly landed B-25. This will give you ideas for a diorama. You’ll love the shots showing the weathering. I’m beginning to think that most aircraft models are under weathered. Seeing the desert camouflage reminded me of “Catch-22”. The flak is really close, in fact the ship with the camera flies right through one burst. Impressive to say the least. One Mitchell comes in for an impressive belly landing. There is one B-25 in particular that is crippled and crashes on landing. You get to watch it in full color as the bomber cartwheels to its death. This is a very exciting DVD. To be honest the first part is really a compilation from the Victory Films library. This does not mean that you don’t “need” the others but if you like things that go boom, this is a great DVD for you. Someone should send this to Hollywood so they can see how a real airplane moves and looks.